Pheasants Forever Farm Bill biologist Kelsi Wehrman and landowner Mark Ohmstede discuss a Farm Bill conservation project along the Republican River in Nebraska. Photo courtesy of Larry Kruckenberg. In the western Great Plains, private lands biologists (also called Farm Bill biologists and technical assistance providers) play a critical role in habitat conservation by matching landowners with suitable conservation programs that best fit the landowners’ personal habitat and land-use goals. Since 97 percent of the land in this region is privately owned, conservation must happen on private lands, making ranchers and farmers important conservation partners in restoring habitat and maintaining large blocks of unbroken prairie. Biologists meet with landowners one-on-one, listen to their needs and concerns, and find the best program for each situation. 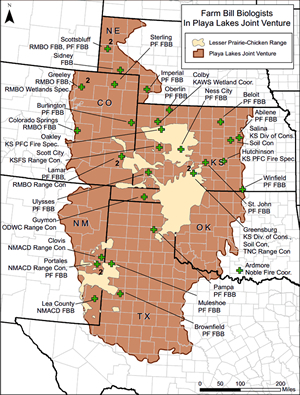 They inform ranchers and farmers about the benefits of conservation programs, such as the Conservation Reserve Program (CRP), Agricultural Conservation Easement Program (ACEP) and Environmental Quality Incentives Program (EQIP), and assist landowners after the programs have been implemented. Farm Bill conservation programs can be very complex. But the biologists work with these programs every day; they will have ideas on which program will best fit with landowner objectives. At the initial meeting, the landowner usually has some goal in mind. It may be a large agricultural producer that wants to find alternatives for low-producing marginal ground or a recreational landowner that wants to improve habitat for wildlife. Private lands biologists are like a one-stop shop that finds programs and funding to help farmers, ranchers and landowners implement conservation programs that may improve overall profitability for their operations and benefit wildlife and our natural resources. Through a unique partnership, private lands biologists are often located in local USDA service centers in priority habitat areas and provide wildlife technical assistance to the Natural Resources Conservation Services and other conservation partners. Funding for these positions is made possible by a variety of partners — such as state wildlife departments, soil and water conservation districts, Natural Resources Conservation Services, migratory bird joint ventures, local Pheasants Forever chapters, watershed groups, foundations, and other state and local partners — working together.